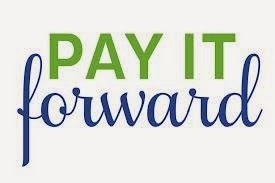 PAY IT FORWARD- Yesterday I was in a meeting downtown and I knew I only had 2 hrs on the meter but I didn't want to miss any important information or the opportunity to speak to some key decision makers after the seminar. So after my meter had long expired I see the ticket guy in this little car with lights blaring and he's got a ticket on my car, yet as I glance at the meter it's got 11 min left.... I tried to talk my way out of it explaining my situation and the guy said, Well it's your lucky day, see that lady down there, she put money in your meter as I was writing the ticket, he then grabbed the ticket off my windshield and said I don't normally do this. I profusely apologized and thanked him as he walked away on to the next ticket. So I was able to thank the nice lady for putting $ in the meter and for this I say PAY IT FORWARD TODAY, this week, or this month. Have a great Thursday.